Managers and administrators in the public-policy and nonprofit sectors rely heavily on analytical skills to quickly pore through a massive amount of research. They dissect it and apply specific, useful data that can inform critical policy changes and help them improve their organization’s overall performance and financial position. To master this vital role, it is imperative that they and their staff learn to be more efficient at collecting, analyzing and evaluating research material, by discovering how to ask the right questions and quickly discern valuable information from useless data. 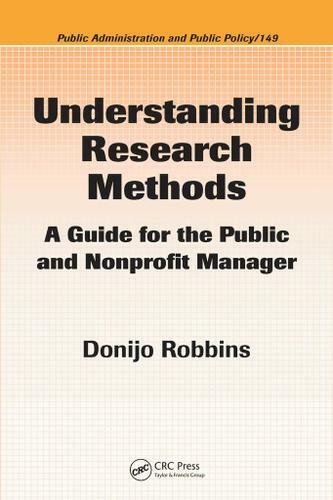 Focusing on the entire research process from start to finish, the compact but comprehensive Understanding Research Methods: A Guide for the Public and Nonprofit Manager explores the research designs and analytical tools that are the foundation for decision-making. Relying more on concepts and analysis than on mathematics, this text provides insight into the definition, process, importance, and capabilities of research – addressing the topic from the perspectives of both the producer of data and the consumer who evaluates its usefulness. This versatile text is intended for dual uses – as a textbook for graduate and undergraduate students in public and nonprofit administration and public policy, and as a practical guide for the average administrator. Both groups will learn how to develop proper research questions, define specific research purposes, and form hypotheses that avoid confusion in measurement and analysis. Imparting basic practical knowledge, it outlines effective approaches to gather accurate, relevant information and then effectively interpret and communicate it.